Warehousing is basically an infrastructure that companies need to have to store raw materials, food grains (farm produce), animal food and finished goods before they are shipped to buyers. There is virtually no business that does not have a need for a warehouse. In many instances large factories and government-owned granaries store their produce across the length and breadth of the country as part of their logistic plans. There is yet another segment of business that offers warehousing as a service to manufacturers for safekeeping and storage. 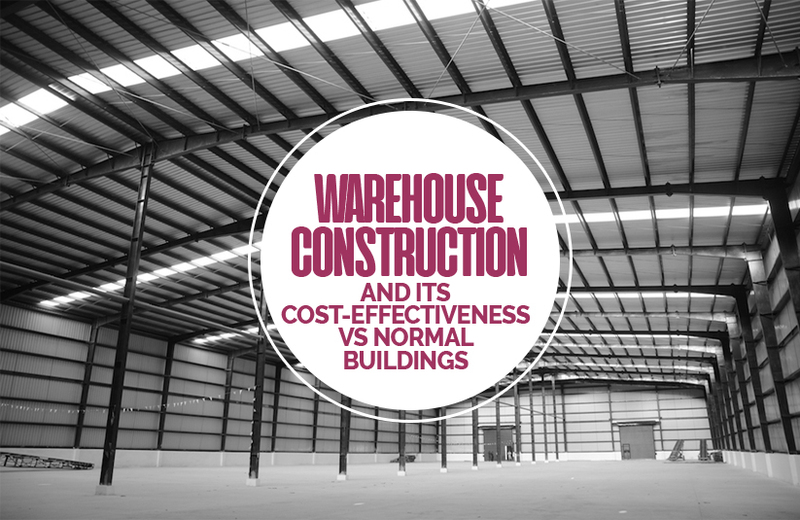 There is no end to the kind of warehouses that can be constructed. Some noted speciality warehouses include: cold-storage warehouses, granary warehouses, machinery warehouses and so on. When warehousing is offered as a service, warehouse construction cost becomes a critical issue, because, to be economically viable, they must be large (typically a single warehouse can be one or more million square feet in spread) and constructed to accommodate large machinery and stacks of grains as tall as 20 or more feet. For easy storage and easy movement of goods, the building must have fewer pillars than a normal building and must also have a longer than usually lifecycle. Earlier, before steel prefabricated warehouse buildings came into existence, warehouse construction companies used concrete in warehouse building design, but as needs began to outgrow availability, the need to go in for cost-effective warehousing began to get due attention. The end result was steel prefabricated warehouse buildings. The benefits of steel buildings are not difficult to see – they can be built quicker, they are cost effective (warehouse construction cost per square foot), consume less of scare and energy-intensive cement, cost less to maintain and are generally more durable. Prefabricated buildings have today almost fully replaced normal buildings throughout the world. Here are a few point-by-point comparisons that make normal buildings obsolete. Normal buildings are either brick masonry or concrete construction and require expensive and difficult to procure raw materials such as warehouse cement and river sand. Steel prefabricated don’t need any of these materials. Normal buildings are not effective against protecting from earthquake and other natural calamities. Steel fabricated buildings are less affected by earthquake and provide greater protection from natural calamities such as cyclone. Normal buildings require water in substantial quantities, and where available it has to be soft. Steel prefabricated buildings don’t require water at all – even the pre-treatment process is done at the factory. Normal buildings require deep foundations and require massive earth-moving equipment at the construction site. If you propose to locate a warehouse on the hills, moving such equipment is almost impossible. Normal buildings have a greater need for maintenance; steel has fewer issues with weathering and also can withstand higher wind speed. There are fewer, options for normal buildings. It is a different story with steel buildings with endless options. Most warehouse construction companies have ready-to-erect prefabricated steel buildings that prove to be advantageous to warehouse operators. The benefit of choosing a predesigned prefabricated building is that warehouses don’t have to go through the tedious process of hiring an architect to design the structure or even contract the erect work to a construction firm; practically everything is taken care by the manufacturer who can even show you visuals of a what your building will look like once it is constructed. Ordering a prefabricated steel warehouse is a simple job nowadays because most types of warehouse needs – cold storage warehouse, granary warehouse, machinery warehouse and many others can be ordered straight away. It is as simple as calling at a manufacturer’s office and giving a brief idea about the plinth area you need and any other specifications you might require for compliance.